Cherry trees are members of the stone fruit family. This is a group of fruit trees that bears fruit with a hard seed that is known as a pit. Although cherry pits can be germinated by seed, many cherry fruits are hybrids. The tree that grows from the cherry pit will not resemble the parent plant. One popular method of propagating a cherry tree is to root a cutting. Sharpen a pair of shears before taking a cutting to prevent bruising the cutting. Select a branch for cutting from a cherry tree that is less than five years old. Cuttings from older cherry trees should be taken from the youngest branches. Position your shears 6 inches from the tip of the branch with at least three points where a leaf emerges from the branch (nodes) located on the cutting. Make a cut horizontally across the branch. Strip leaves from the lower two-thirds of the branch. Dip the end of the branch in rooting hormone. Fill a 6-inch peat container with peat moss. Water the peat moss until it is as wet as a wrung-out sponge. Insert the branch halfway into the soil. Place a plastic bag over the top of the container and put the container in a sunny windowsill. Check the bag daily and water the cherry tree anytime it seems dry. Keep the potting mix as damp as a wrung-out sponge. Remove the bag when the cherry tree sprouts roots. Continue to water the cherry tree whenever the soil mix dries to keep it as damp. 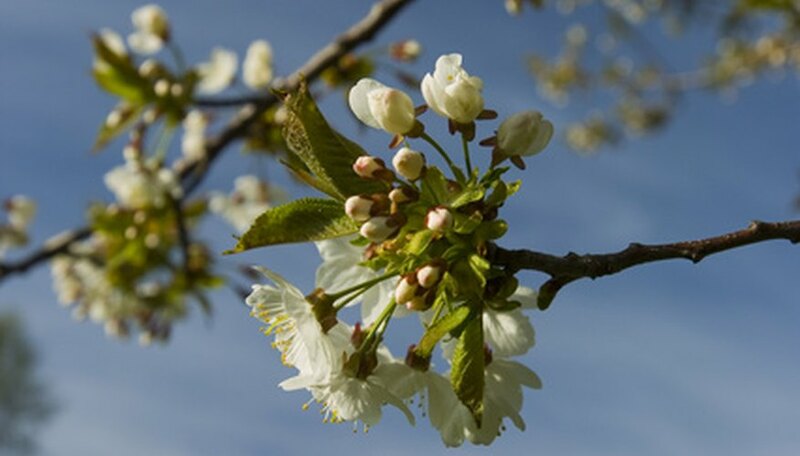 Move the cherry tree to a gallon-sized container when the roots fill the 6-inch container. Place the tree outdoors in the shade during daytime hours for a week before transplanting the tree outdoor to harden it off. Select a transplant location for your tree in full sun and well-drained soil. Dig a planting hole that is twice as wide as the tree, but no deeper. Pull the cherry tree out of the gallon container by turning it on its side and shaking the root ball free of the tree. Support the tree’s trunk with one hand. Lift the tree by the root ball and place it into the planting pocket. Fill in the sides of the planting pocket with dirt and lightly cover the top of the root ball with 1 to 2 inches of soil. Water the tree to dislodge any air pockets. Fill in the soil depressions with soil.